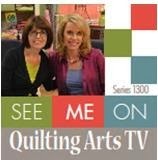 Quilting Arts TV - It won't be long now! Hi ya! Oh my gosh! 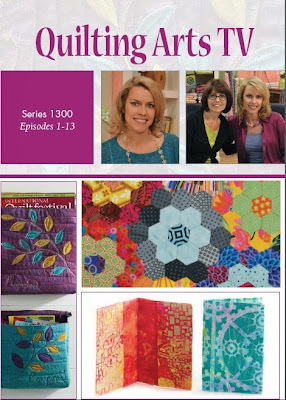 As if I haven't been an excited, hyper little bunny enough over Fellowship of the Flowers, I received an email from the Quilting Arts TV folks too! The 1300 series will begin airing on PBS stations here in the US in January. Be sure and check your local listings to find out if you get this fun show. It's a wonderful season of fun and I'm delighted to be among some extremely talented artists. I still can't believe I got to be included with these gals. They rock! I am in four episodes, 1305, 1306, 1307 and 1311. Below you can preview each of those episodes. I also want to take a minute to thank you for signing up for Fellowship of the Flowers. Please spread the word to your friends and guild members. This is going to be a fantastic year together! Woo hoo! Alrighty then. I'll see you back here on Wednesday with the first flower in the fellowship! Hoppy Friday - Fellowship of the Flowers! 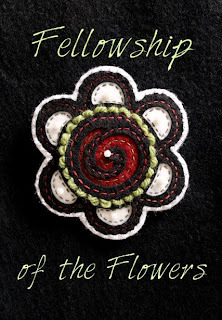 So, here is a review of what Fellowship of the Flowers is all about. · Companionship: We will be stitching companions for 50 weeks. Every Wednesday starting January 1, 2014 until December 17, 2014 you are invited to visit my blog for inspiring ideas on stitching your flowers. · A mutual sharing: We will share photos of our completed flowers and projects on Pinterest, Flickr and Facebook . 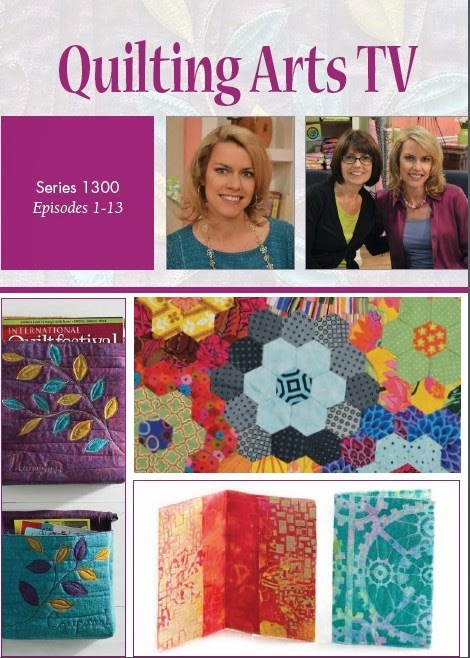 · A group of people with the same interests: We will explore the world of Folk Art Fusion® and art quilting together. Not only will I teach you how to make the flowers, you will receive complete instructions for 12 projects using the flowers. Project instructions will be emailed to you the last Wednesday of the month. · An endowment for the support of a student or scholar doing advanced work: Your fellowship fee of $35 entitles you to 50 weeks of inspiration and learning. Upon joining, you will receive 5 flower patterns, a bonus bee pattern and instructions on layering the pieces. In addition every month for 12 months, you will receive a project using combinations of the 5 flower patterns and the bonus bee pattern. You are invited to share your finished projects, ask questions and be part of a worldwide group of friends. Your fellowship fee, which basically amounts to .70¢ a week, allows me not only to continue designing Folk Art Fusion® projects for your enjoyment, but it also allows me to support rabbit rescues around the USA in addition to supporting my family. For this the bunnies and I send our heartfelt thanks. The first flower will make its debut here next Wednesday, January 1st. There will be a separate page here on the blog where I will keep all the flowers for the entire year so you can look at them any time you want. I will also list links to groups where you can post your flowers and share your artistry with other friends in the fellowship. Grab the button from my sidebar and pass the word! So, are you ready to have some fun together in 2014? The KITS are available in my SHOP and as an extra way to say thank you for joining me and the bunnies on this adventure, the first 20 people to purchase the wool kit will receive a FREE kit (shown above) to make the flower in Fellowship logo! Fun! Lastly, my Folk Art Fusion pearl cotton thread kit is available. This is a size 12 pearl cotton, which is comparable to the three strand floss. I'm using the pearl cotton on Fellowship of the Flowers as there is more yardage on each ball and it should last the entire year. You can also use whatever threads you have available. You know how much I love Lindsey Stirling. Well this is her new Christmas song. I think it is perfect to go with my wishes for you. Merry Christmas dear friend. You are the best gift to me. Hi ya! Well we are on the home stretch. Are you ready for the Christmas festivities? I am even though it was 80 degrees here this weekend and it had me in a spring cleaning state of mind! hee,hee,hee. Well, I just can't help myself. I have to give you a sneaky peeky of two flowers from "Fellowship of the Flowers." Don't forget, signups start this Friday, December 27! The first flower will debut on January 1st. I'm SOOOOOOOOOOOOOO excited I could pop! Have a fun day and safe travels if you are traveling this week. The bunnies will see you on Christmas day with a card. There is just so much that that has made me smile this week. My heart is filled with joy as Christmas approaches. Here's a look back at the week. Arthur Court ornaments. I collect Arthur Court bunny things. I love the fact that they support animals and lots of wildlife. Mommy Syl, Captains mom, gave me this ornament. David and I have been together since 1989. We started collecting ornaments then. Every year on our anniversary in September, we get another ornament. This is the one we got this year. Pig Pen making a snowman. We love Charlie Brown's Christmas. Every year Beth, my best friend of 33 years, and I exchange ornaments. We always laugh that they will hang on our tree in our nursing home room when we are old ladies. Beth made these awesome wool pine cones this year. She also makes her cards. This is one she gave me years ago. When we were little her parents would take us camping and we always had s'mores. This brings back the most wonderful memories. She also gave me this fella many years ago. He reminds me of the wizard Radagast in the Hobbit movie. I purchased this handmade ornament at a craft festival last month. The man who makes these is so very nice. I was happy to find something handmade. I think I have a thing about hobbit looking stuff. hee,hee,hee. This little bunny was extremely spoiled by Di and Miss Gracie. My gracious! They sent so many wonderful things that I love: Pencils to use in my new sketchbook, fun socks, peeps (like my peeps in my yard), a wool bunny ornament, handmade dish cloths. Thank you so very much Di and Miss Gracie! My friend, Carrie Pippin, is one of the most kind hearted people I have ever met. She made this darling stitchery for me. Isn't the dress adorable with the bunny fabric? Thank you Carrie! Cards from dear friends around the world came in too. This handmade card is from our friends, Rachel and Speedy in the UK. Speedy is our bunny friend who had to have his eye removed this summer. He's doing very well and looks super cute in his hat don't you think? Our wonderful friend Juliet, The Crafty Green Poet, sent us this card and bookmark. Juliet is the queen of re-purposing things, living simply and living life on purpose. She writes the most wonderful poetry. This card came from darling, Pauline in Australia. I love that it is handmade. Here's what the back of the card says. Cool huh? This fun card and ornament came from our fun friend, Fiona in Australia. Have I told you how much I love my Aussie friends and how much I want to visit there one day? I love having this on my tree. Speaking of trees, the entire middle section of lights burned out on my tree last week. It was quite comical. We took all the decorations off. David reworked all the lights and then redecorated it. All is happy again. Of course, my tree topper always makes me happy. This is one of my most favorite things. It is handmade and I've had it since the mid 90's. An elf and a bunny. LOVE! My mom and Oliver sent us this wonderful goody basket! Wine, chocolates, cheese and crackers. Oh boy! Thanks mom! My fun friend, Sharon Jett, attends estate sales all the time. She finds the most wonderful treasures. She sent me this adorable crochet piece. It kinda looks like a lop bunny, but I think it's actually a puppy. What do you think? This would look wonderful made into a pillow. On the to do list for the new year. In closing, I want to say that I am most happy that after three years, Captain and Eric are back home this year. That means Christmas Eve dinner at our house. We are having seafood lasagna, salad, wine, rolls and some chocolate cake. 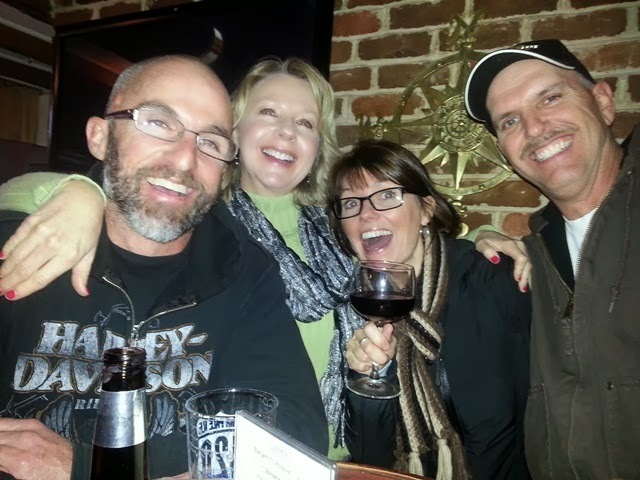 There will be laughter, smiles and lots of good times. We will spend Christmas day with them too. Friends are gifts we give ourselves. I am most grateful for such wonderful gifts. So what made you happy this week? I would love to hear. Hello there! 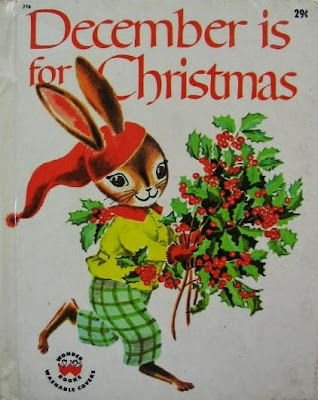 Well one week to go until all the food, fun and festivities of Christmas day and only two weeks until the "Fellowship of the Flowers" begins! Woo hoo! I do love the fresh start of a new year and thinking about all the adventures I want to have. 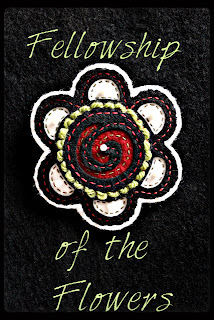 I'm just soooooooooooooooo excited about the "Fellowship of the Flowers." It's like a block of the month but better! It's inspiring! It's a mystery every month! It's going to be so much fun! In fact, I'm going to start signups on December 27th! 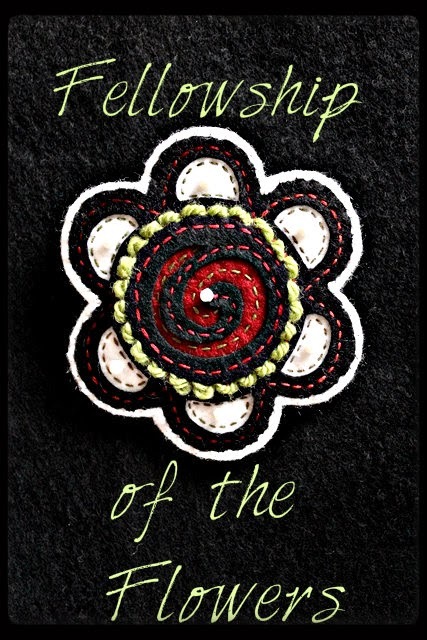 What is the “Fellowship of the Flowers”? Companionship: we will be stitching companions for fifty weeks. Every Wednesday starting January 1, 2014 until December 17, 2014, you are invited to visit my blog for inspiring flower stitching ideas. A mutual sharing: we will share photos of our completed flowers and projects on Pinterest and Facebook . A group of people with the same interests: we will explore the world of Folk Art Fusion® and art quilting together. Not only will I teach you how to make each flower, you will receive complete instructions for 12 projects using your flowers. Project instructions will be emailed to you the last Wednesday of each month. An endowment for the support of a student or scholar doing advanced work: your fellowship fee of $35 entitles you to 50 weeks of inspiration and learning. Upon joining, you will receive 5 flower patterns, a bonus bee pattern and instructions on layering the pieces. In addition, every month for 12 months, you will receive a project using combinations of the 5 flower patterns and the bonus bee pattern. You are invited to share your finished projects, ask questions and be part of a worldwide group of friends. 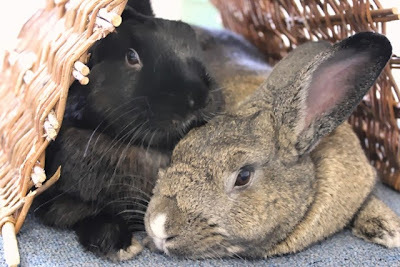 Your fellowship fee, which is less than 70¢ per week, allows me not only to continue designing Folk Art Fusion® projects for your enjoyment, but it also allows me to support rabbit rescues around the USA. 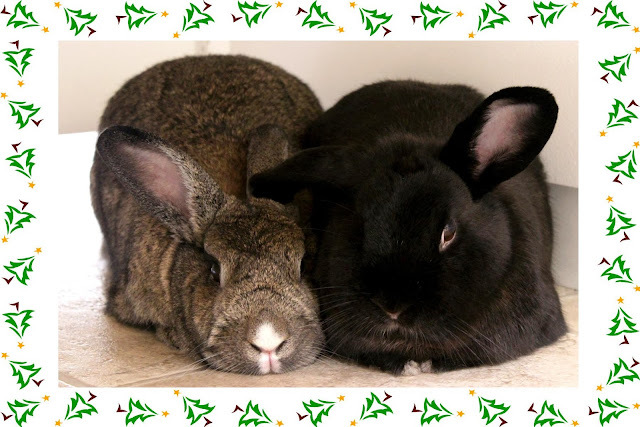 For this the bunnies and I send our heartfelt thanks. and pearl cotton kits available for purchase in my shop. This will also be a great way to use up scraps of fabric and little embellishments you may have laying around. Not to mention, you can be ahead of the game for gift giving next Christmas (I really need that part). Signups will begin December 27th. This will be done through Craftsy only. There will be no printed patterns of the flowers, PDF only. Starting January 1st and every Wednesday for 50 weeks you will see a finished flower on my blog for inspiration on finishing your flower. However, the only way you get the instructions and the patterns is to join the Fellowship. The last Wednesday of the month I will show you a project using the flowers. All those who have joined the Fellowship will be emailed the complete instructions for making the project. You may join the Fellowship at any time, but it will end completely on December 17, 2014. I am truly looking forward to sharing this 50 week adventure with you. Something happy, positive and creative to look forward to each week with friends. Please let me know if you have any questions and pass the word! Copy the button from my sidebar if you like. Hi ya! How was your weekend? Are you ready for Christmas? I can't believe it's almost here! Today I am very excited to share this video with you! This was filmed at the Houston Quilt Market back in October. 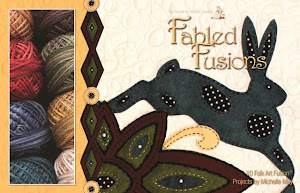 May I introduce my Fabled Fusions book and show you the projects? It's a little hard to hear, so turn up your speakers. Now, for the extra exciting news! Fabled Fusions is now available as a download! No shipping, no waiting. Just download and get started making Folk Art Fusion today! Hop over to my Craftsy shop. Of course, you can still order a printed version and some kits for the projects. So are you ready to give Folk Art Fusion a try? It's lots of fun. I can also come to your guild for a play date and chat. Hop over to my Shop for more information. See you Wednesday for more about "The Fellowship of the Flowers." Hi ya and Hoppy Friday! For those of you who are new to following my blog, (hello and welcome) every Friday is Hoppy Friday. I list several things from the week that made me happy and I was grateful for. I invite you to share here too. a really, really cool piece of original folk art! My mom found this piece in an antique shop in NC. I loooooooooove him! He's made from some sort of paper clay or paper mache'. He's pretty big, around 17" long. I'm going to hang him in Bunnyville. I think he's pretty funny with his worried look on his face. Maybe he got stuck in that carrot because he ate so much of it his belly got fat. hee,hee,hee. Next, happiness is getting Christmas cards from dear friends. I know many of us now send e-cards, but there are certain people who still send me real cards and it just wouldn't be Christmas without them. Enclosed in one of the cards was this adorable handmade ornament from my friend, Sharon of Vroomans Quilts. Sweet! Thank you Sharon! Mommy Syl, (Captain's mom) sent me these adorable dinner napkins! I love fun napkins and will use these for Christmas Eve dinner. I use to use cloth napkins all the time, but lipstick, olive oil, chocolate, spaghetti sauce, you name it was always making a huge mess that I could never get out of the cloth. I do put these in the recycle can when we are done with them. this handmade ornament she found. I think this little lady looks a bit pouty. Perhaps she is worried she won't have any friends on the tree. I shall put her next to Jingles. Jingles was made for me by my darling friend, Anita of Castles, Crowns and Cottages. Jingles is always smiling so I know he will make fast friends with our new lady. Finally this week, I am happy because my two snuggly little bunnies love me so much. They always come up to me, put their heads together like this and wait for me to pet them. I usually lay down on the floor and we have a group snuggle. No matter what happens in the day, this will always make me happy and grateful. Pets have a way of doing that don't they? I found it. My second PHD. I knew it was around here somewhere. If you are wondering what PHD stands for, read the post from Monday. Each month would meet at a members house for dinner. The member would show what they added to the other members quilt. However, you as the owner were not allowed to see. It was a secret until the end. Then, we would hand off the quilt to the next member and another round would be added. Around and around the quilt was passed. Each member adding another section. Until the final month when we all went out for a fancy dinner and had the big reveal. Oh what fun it was! I started to hand quilt this piece all those years ago and then in the true nature of a quilter, I got sidetracked with other projects. I've decided to rip out the hand quilting and just finish it off by machine. It's small enough that I can handle the machine quilting. Anything larger than this gives me a migraine and a backache. When I was photographing this quilt for today's post, I remembered how much I looked forward to each month spent with friends and creating something fun and mysterious. I think that's why I'm looking forward to Fellowship of the Flowers. But, instead of once a month, we will have something every week to look forward to. I can't wait! I'll tell you more about it next Wednesday. Textile Art - What do you do?